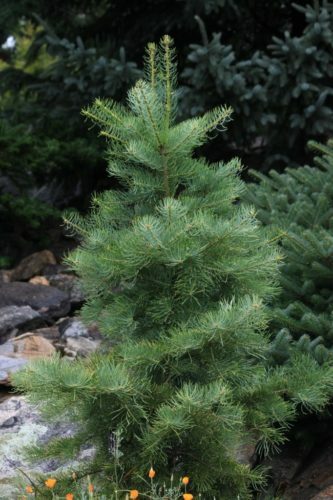 Abies concolor 'Wintergold' is a seasonally variable dwarf selection of White fir. In early spring, new growth pushes bright chartreuse-green which contrasts wildly with the previous seasons butter-yellow needles. Later the new growth matures to dark green, then finally changes back to all butter-yellow with the onset of colder weather in the fall. The needles are of species-typical size, long and lance-shaped. Branching is horizontal in nature. With proper pruning, the tree can be trained to be either spreading or upright. Typical rate of growth in most areas is 4 to 6 inches (10 - 15 cm) per year, resulting in an irregular upright conifer 40 inches (100 cm) atall and 28 inches (70 cm) wide after 10 years in the landscape. 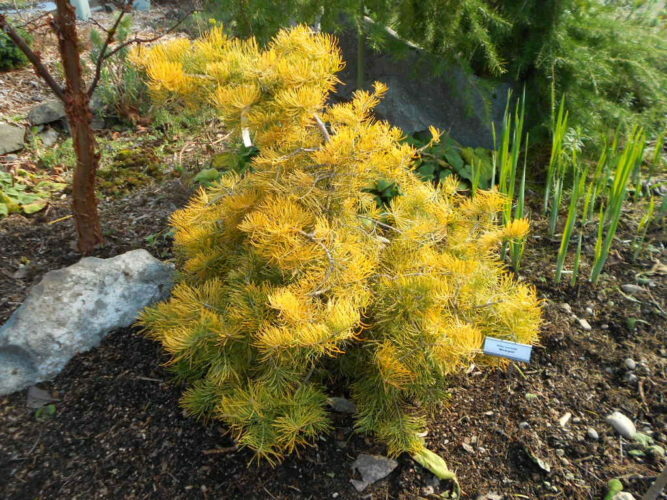 Bob Fincham, in Coenosium Gardens Catalog, describes, "a small tree with yellow-green foliage that turns bright gold in winter." Günter Horstmann of Schneverdingen, Germany, first introduced 'Wintergold' in 1959 as a unique selection from a batch of White fir seedlings. The gallery photos above quite clearly demonstrate the seasonal variability of this very desirable cultivar. This cultivar is best used for "lighting up" a dark corner of the garden in the winter, acting as a beacon which will draw in the observer. Abies concolor 'Wintergold' A specimen at Glacier's End Arboretum, Olympia Washington demonstrating stunning winter color. Purchased from Conifer Kingdom, Silverton Oregon in late 2012. Abies concolor 'Wintergold' A specimen showing the color of a seasons new growth. With the onset of winter, this green foliage will turn golden.